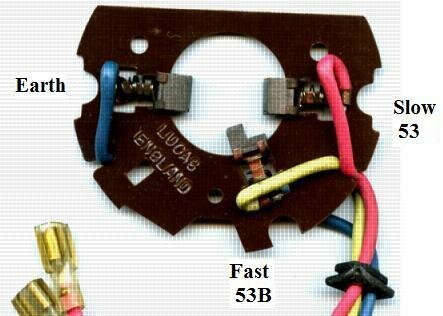 Never ceases to amaze me the bl88dy awful wiring diagrams on reputable sites. 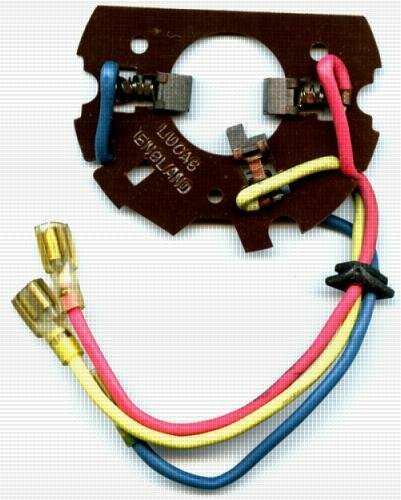 Here is a labelled pic of a Lucas wiper plug. 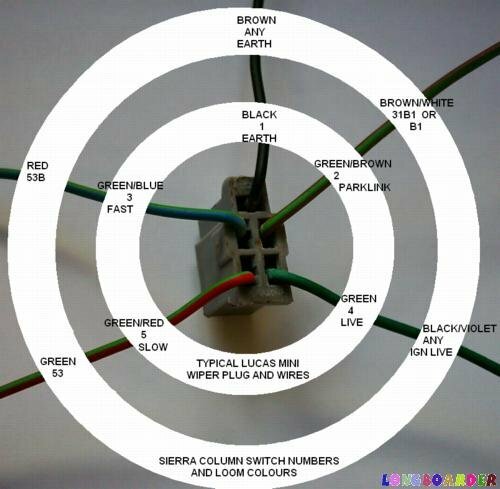 Of the two label circles the inner one are typical lucas wire colours and Lucas wiper motor pin numbers and the outer label circle are sierra wire colours and sierra column switch pin numbers. If this isn't enough there is a more diagramatic style wiring diagram which is shown with the ignition on but the wiper has just been switched off and is part way through its park cycle. The red bits are live from the ignition but are not supplying via the switch. 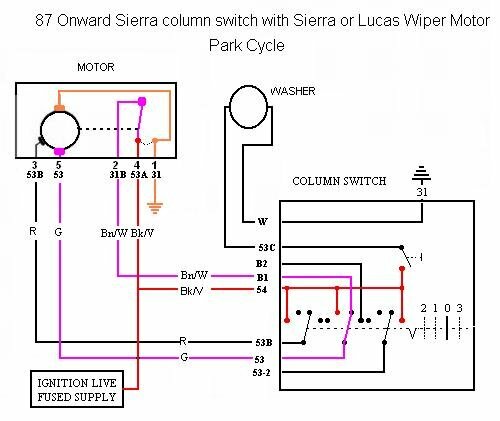 Instead the red supply to pin 4 on the lucas motor (pin 53A on sierra motor) is feeding back current along the lilac path, out of Lucas pin 2 (sierra pin 31B) through the switch and back out to pin 5 on the Lucas motor (pin 53 on a sierra motor) to run the park cycle. When the wiper motor reaches the park position a cam in the motor breaks the connection between lucas pins 4 & 2 (sierra pins 53A & 31B) and the motor stops with the arms neatly parked. If you also do a search I had a thread a few weeks ago about exactly this. Although I had some issues but there is some excellent fault finding and tips from long boarder and others on my thread. 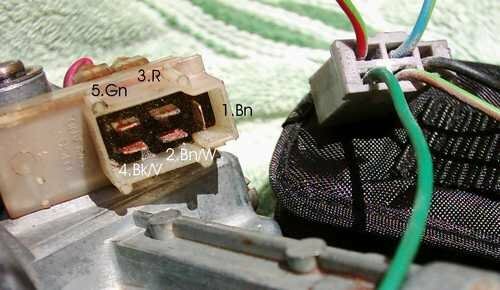 Sounds like you have a motor with the brushplate wires only and no connecting plug/park switch. It is a usually white plastic housing with five terminals. The 3 brushplate wires go to pins 1,3,5 in the back of the plug. Park switch is 2, 4, unwired on the back. It sits on the surface of the crank and gear housing. You can make out some of it in the pics below. One shows the brush plate and it's 3 wires, red (slow), blue (earth) and yellow (fast) in this case and the other shows the plug and part of its white housing sitting on the motor. No mines a mini motor with those these colours coming from the motor so I wire them straight to the stalk ? 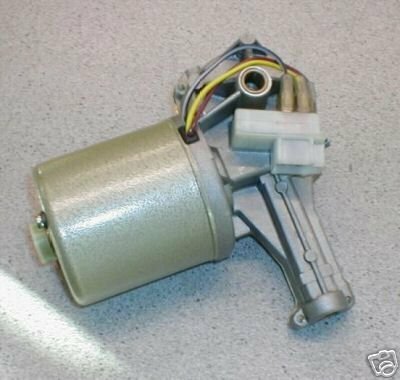 Does your motor look very similar to this? So, confirm a lucas two speed motor. The pictures I posted previously are from that type of motor. The brush plate is. The other view of the five pin plug is too. It does sound as if you need the white park switch box. The three leads you have can be connected to the sierra column switch but without the park switch box you will not have wiper parking. IVA fail. But if you want to go ahead without the yellow lead connects to 53B, the red lead connects to 53 and the black to any earthing point on the car. I can't guarantee those colours. You can look at your brushplate and work out which of your wire colours does what. But I would advise you to buy a park switch box and fit it.